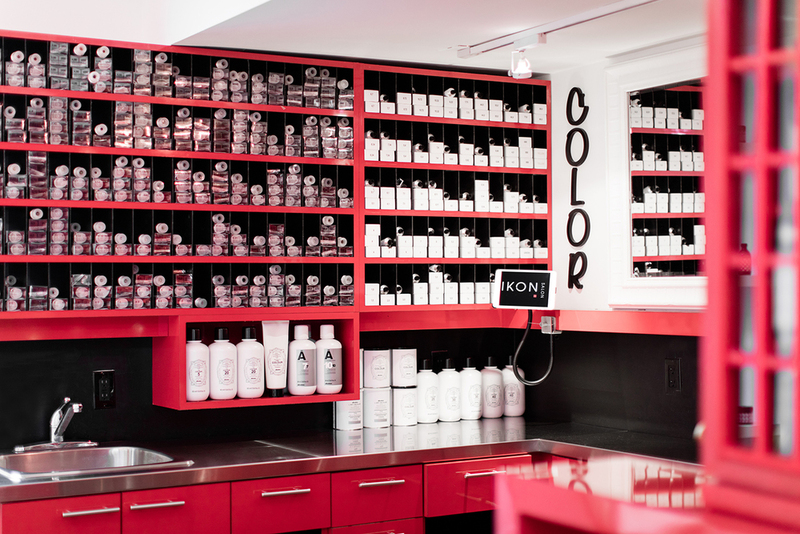 IKON SALON is a vibrant, fashion-forward hair salon located in midtown Toronto. Complete with a creative team of professional hairdressers, IKON is committed to exceptional service while delivering high-quality hairdressing to all of its clients. IKON understands the importance of balancing modern, sophisticated techniques with wearable, practical styles to complement individual looks. The sleek environment coupled with the team’s exceptional customer service and passion for hair create a unique, welcoming salon experience. Internationally renowned, multiple award-winning stylist Domenic Iannuzzi founded IKON SALON following 16 successful years as co-owner of Toronto’s Epoca salon. Domenic and his team have rebranded and relocated to offer clients a salon experience that reflects their deep-rooted passion for superior hairdressing and service. We are proud to be a member of Green Circle Salons. Colour prices are based on a combination of time required and the amount of product used during the service. The amount of product can vary pending on the length and the density of the hair. Colour corrections and fashion shade prices are based upon consultation. The prices below are only a guide. An accurate price will be determined during consultation, or at the beginning of the appointment. Our tiered pricing structure reflects the education level, training and practical experience of each individual team stylist. A blow-out after your colours is is not included with any coloured service. There is a $25 discounted charge for a blow dry with any stylist after colour. You are also welcome to use our complimentary blow-dry station, with access to all our hair tools and products to finish your hair. Colour goddess Ani Travassos is regarded by her loyal fans as one of the city’s top colourists. With over 20 years experience in the industry, and experience with over 7 colour lines, year after year Ani continues to build on her already-impressive arsenal of techniques and colour methods and has lead IKON’s colour department since its inception. “I’ve always dreamt of being part of a team that works together to motivate one another and provide unmatched service to its guests, both technically and creatively,” says Ani. *Colour correction is based on individual consultation. Kelsey is best described as a ‘Master of Natural Looks.’ From balayage to perfectly toned highlights, she always delivers your envisioned #hairgoals. After 10 years of being a colourist at top salons in the city and learning from the best, she takes on all corrections and knows what tone and overall look will best be suited for each individual. She is up to date with all the current trends and is guaranteed to give you the hair of your dreams without compromising the integrity of your hair. While being a part time Clinical Nutritionist, Kelsey will be happy to schedule you in from Wednesday to Saturday to give you your best hair yet! Our tiered pricing structure reflects the education level, training and practical experience of each individual team stylist. All cuts include a shampoo, conditioner, a relaxing scalp massage and a blow-dry. The prices below are only a guide. An accurate price will be determined during the consultation, at the beginning of the appointment. Multiple award-winning stylist Domenic Iannuzzi started his journey into the hair industry at a young age. At just 18, Domenic was demonstrating hair-cutting and styling techniques on stage at some of the biggest Canadian hair shows. Honing his skills in top salons, he further developed his eye by styling hair alongside fashion photographers. This allowed Domenic to advance quickly as a stylist, and at 21 he was profiled in Salon Magazine as a rising star. It didn’t take long for Domenic to realize that his passion for hair combined with a fiery determination would set the tone for an exciting career. His work has been featured in many magazines, including Chatelaine, Wedding Bells, Oxygen, Today’s Parent, Canadian Hairdresser, Modern Salon and Salon Magazine. This three-time award winner has been a makeover guest artist on television shows such as Steven and Chris, Shop Toronto and Images. Anna began her career in Montreal over 20 years ago. Her artistic vision, passion and education has always pushed her to thrive in this industry. She mastered her cutting skills through extended training with Elite artistic team educators. Anna has worked backstage in fashion shows, photo shoots and participated in various fundraisers. A master of her craft, she keeps up with latest techniques in hair trends. So whether you want a contemporary classic cut or a trendy avant-garde look, you are sure to be pleased with your experience as well as the results. Senior stylist Michael has been an asset to the hair industry for more than 20 years, offering a wide variety of hair-cutting and styling techniques. Michael is always up-to-date with changing trends and is well-versed in timeless, classic looks. Although he’s kept busy with a constant flow of loyal clientele, Michael always welcomes new clients looking for that special stylist who can bring their hair back to life. With passion and consistency, Michael always provides the utmost in professionalism, making each hair appointment a rewarding experience from start to finish. We guarantee our services, taking the utmost care with your hair by using the finest products available. Our highly trained team is committed to excellence, providing professional advice and services. It is important to take care of your hair for lasting results. We cannot guarantee lasting results if you take medication or use unsuitable shampoos/conditioners. We ask that you kindly provide us with a minimum of 24 hours’ notice for the cancellation of any appointment. We look forward to serving you at IKON SALON. If you are new to the booking system, please select “New Guest” and follow the registration procedure.